Maria sees dish stacking as a creative, not a practical experience. The result is a lot of broken glasses and plates. She bristles a bit when I kid her about what I call Irresponsible Stacking Techniques. The result of is this we buy a lot of glasses and dishes at Thrift Shops. It’s called “Creative Stacking,” she huffs. This stacking issue has become a point of disagreement, she thinks I’m just an old fart failing to grasp the boundaries of creativity. She might be right in that. 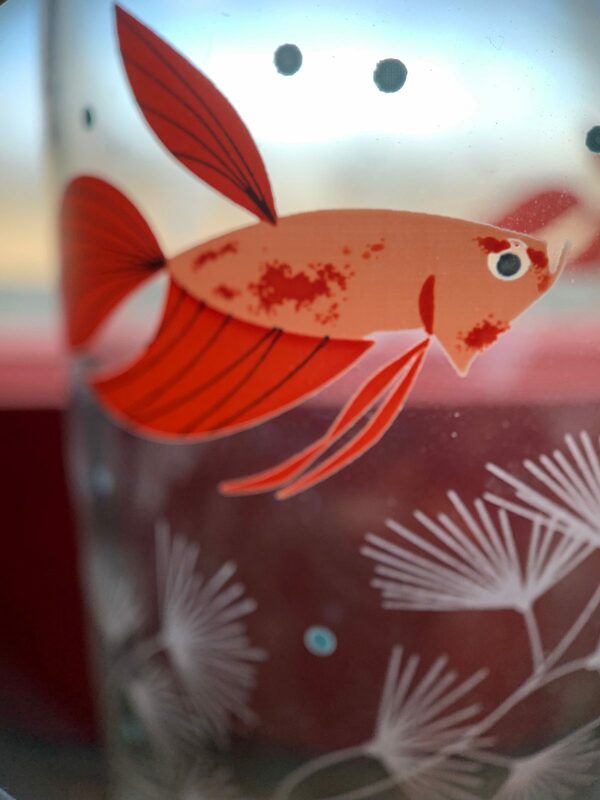 Our friend Anne gave us some very neat fish glasses in honor of our fish tank for Christmas. I used my macro lens to get a closer shot of it. It’s in on of our Windowsill Galleries. Life with an artist. We don’t use it, so she doesn’t have to stack it. Maybe we can keep it awhile.